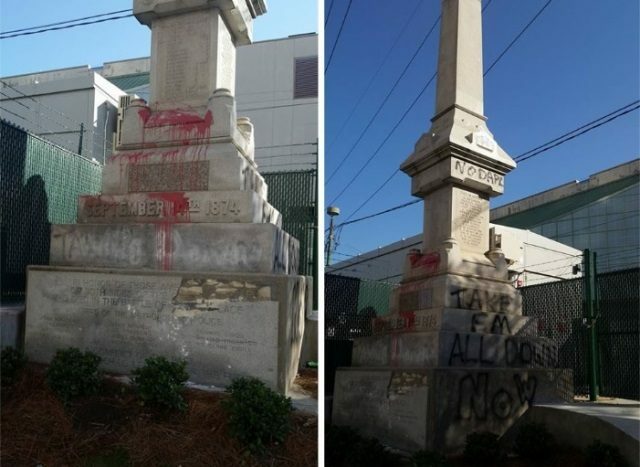 The slogan is a reference to the Black Lives Matter-aligned group “Take ‘Em Down Nola”, which demands that all monuments in New Orleans with historical ties to the Civil War be removed. BLM vandals also wrote “No DAPL” on the monument, which refers to a campaign against a proposed pipeline set to span across North Dakota, where violent protesters have sent security officers and their watchdogs to the hospital, as Breitbart Texas reported. The monuments issue in New Orleans is entirely unrelated to the pipeline, though both are deep-rooted in the idea that minority groups in the country are victims at the hands of oppressors. This is not the first time Take ‘Em Down Nola has publicly threatened New Orleans and the city’s monuments, as Breitbart Texas reported. Months ago, Take ‘Em Down Nola threatened law enforcement officials across the city. One message read: “Fist Up. Shoot Back,” accompanied with the #F*ck12 hashtag, which celebrated the death of New York City Police Department officers and has been previously reported on by Breitbart Texas. The threatening messages came a week before Take ‘Em Down Nola planned to physically tear down New Orleans’ most famous French Quarter monument depicting President Andrew Jackson on horseback, as Breitbart Texas reported. Currently, monument removal in the city is being held up in the courts, with opposition groups trying to slow the process.